I have blogged about cloud computing on the odd occasion previously, and I am convinced that a sea change is occurring that many accountants are missing. New products like Kashflow, Xero, E-conomic and FreeAgent are creating a new market place, with a level of user-friendliness for a small business owner that the likes of Sage can only dream about - all accessible from anywhere with an Internet connection (including your accountant's office). This post from Dennis Howlett's AccMan blog, should be a wake-up call to all accountants in practice, giving a client's view of how far behind the pace some accountants are. It should make interesting reading for all of us, but may be a little uncomfortable for some accountants in practice. Can governments legislate morals into markets? Today, the UK Prime Minister, Gordon Brown, said in a speech to the Labour Party Conference that "Markets need morals". He also went on to say that the the government will introduce a law to intervene on bankers' bonuses. The UK is not alone and there are calls all around the world to legislate on these matters. This makes me a little uneasy. In my experience, excessive legislation tends to allow individuals (and society as a whole) to abdicate their own responsibility to apply moral judgement. Over time this leads to the attitude that we can do anything we can get away with, within the rules. Professions that were once governed by their members' judgements of right and wrong (and their peers' approval and disapproval), are now regulated in everything they do. Wrong-doers get away with it if they tick the right boxes, whereas innocent mistakes are punished. In this environment, the distinction between right and wrong becomes a technicality. When you take responsibility away, people stop exercising it. I might be being naive and I doubt we can ever go back, but does anyone else feel the same way? I'd love to hear your thoughts, either way - examples too. Please comment below. Great post on the always excellent (and exquisitely named) Pointy Haired Dilbert blog showing how to calculate elapsed time in years, months, weeks, days, hours, minutes, seconds and even working days. Includes links to descriptions of other date functions in Excel. I consider myself quite an advanced Excel user but I still come across features and tools that I have never used before. In producing a spreadsheet for a client the other day, I needed to get a sales forecasting spreadsheet (which I had already designed) to work backwards to calculate the number of new leads that needed to be introduced to achieve a required annual budget. I had been planning to re-build the spreadsheet from scratch, working the formulae backwards (no mean feat, it was a pretty complex spreadsheet going forwards), to calculate the answer. That was before I investigated the Solver Add-In, which is provided with the Excel/Office disks from 2003 onwards but not installed as part of the typical installation. This Add-In allows you to set a requirement for the value of a target cell and calculates (through multiple itterations) the value required in another cell to achieve that target value. Great for forecasting. If Solver is not on your Tools Menu, then you need to select Tools -> Add-Ins and tick the box that says Solver Add-In and then click OK. In the box marked Set Target Cell choose the cell that contains the result that you wish to fix, e.g. forecast sales. You can then choose to maximise that cell, minimise it, or require a specific value. You then choose the cells you wish to vary to achieve this (in the By Changing Cells box), Solver can guess these for you if you want. If you have any particular constraints you need to apply, these can be added in the box below. 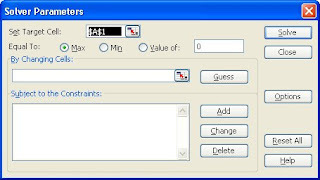 For example, particular change cells might need to be an integer or must be between certain values. There are options to change tolerances, etc. by clicking the Options button, but that would be overkill in this article. You can then click Solve and Solver will change the cells until it achieves the required outcome (or fails to find one that meets the criteria). Assuming it finds a solution, you can choose to keep it or restore the original values. You also have the opportunity to see various reports on the solution. Note that Solver has not added new formulae to the spreadsheet, merely changed an input value based upon your required outputs. This means you can use it in your existing forecast spreadsheets to work out what you need to do to achieve your targets. Have a play, I think you'll find it useful. The Ezine is dead, long live the Blog! Following the comments on the previous post I have decided to stop the monthly ezine associated with the blog, to allow me to spend more time on the content of the blog. Subscribers to the ezine will continue to receive notification of new blog posts by email as before. Thank you to all of our readers and I hope you continue to follow these articles by email or RSS. If you enjoyed this post, go to the top left corner of the blog, where you can subscribe for regular updates, and your free report. Blog, Ezine or both - please let me know? I am considering a slight change to the format of Not Just Numbers and would like to get some feedback from readers. 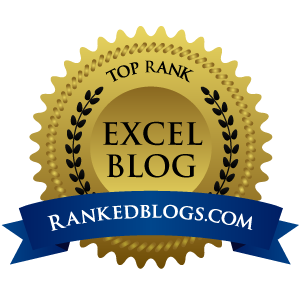 Not Just Numbers started as a monthly ezine and then extended to include this blog. The blog includes all of the articles that are in the ezine as well as many posts that are not. Subscribers to the ezine receive regular emails with links to the latest blog posts - as well as the ezine. On the face of it, the time spent compiling and formatting the ezine adds no new content for readers who receive the articles anyway in the blog digest emails. I feel that this time might be better spent adding extra content to the blog. Before I make this change, I would really like to find out what readers think. So, please comment on this post with any preferences you have either way. I look forward to hearing what you have to say.